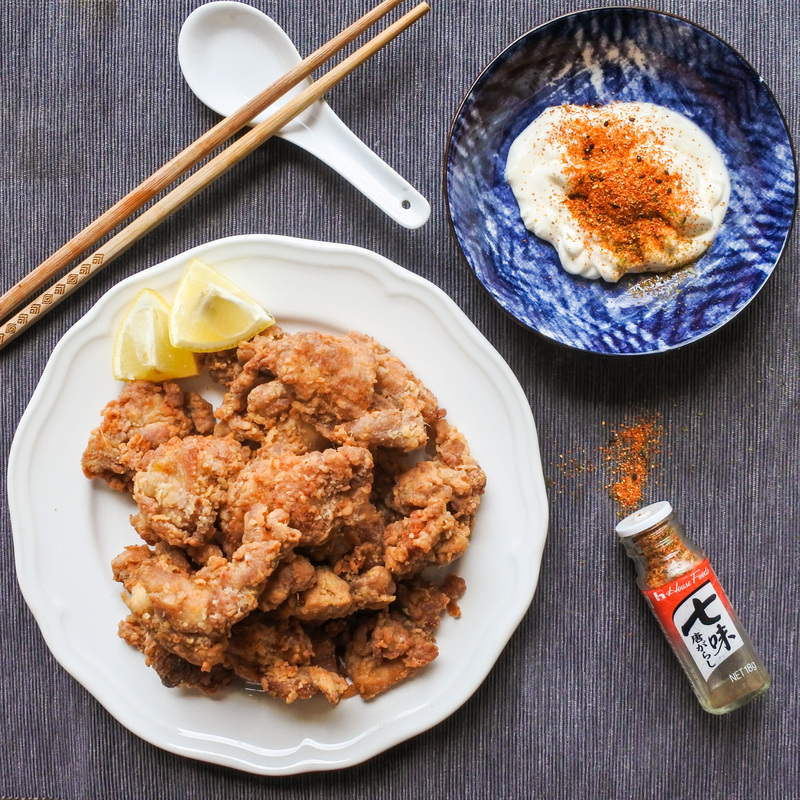 I first learned how to make karaage (kara a gee) chicken in a Japanese cooking class whilst living in Beijing. That was where I learned that coating things in cornstarch and frying until crispy was inspired by Chinese cooking to which I say, thank you China. For me, karaage chicken is a necessary order at any Japanese restaurant. As a result of my constantly ordering and eating it, I consider myself a bit of a connoisseur of this delightful dish of Japanese fried chicken. Chicken breast can be used for those so inclined but I found that boneless dark meat makes for the juiciest morsels. Whatever you choose, it’s fairly easy to throw together. Simply marinate it, coat it and fry it and you will have a tasty plateful of delectable chicken. Serve it on its own or with a big bowl of steaming ramen. Puree ginger, garlic cloves, soy sauce and cooking wine together to make the marinade. Cut chicken into bite sized pieces no larger than 1in/2cm long. Pour marinade mixture over chicken thighs along with salt and sugar. Toss to even coat, cover and let marinade in the refrigerator for an hour. In a separate bowl, mix together flour and cornstarch until evenly dispersed. Dredge marinaded chicken in flour mixture. Heat a generous amount of frying oil in a large pan or wok over medium high heat. You will know when the oil is hot enough for frying when you see sizzling when you add a drop of batter or dip the end of a wooden chopstick into the oil. When oil is hot, add chicken and fry until golden brown and crispy on all sides. When chicken is nice and crispy, take out and drain on paper towels to soak up excess oil. Serve with lemon wedges, mayonnaise and shichimi togarashi powder. Puree ginger, garlic cloves, soy sauce and cooking wine together to make the marinade. Cut chicken into bite sized pieces no larger than 1in/2cm long. Pour marinade mixture over chicken thighs along with salt and sugar. Toss to even coat, cover and let marinade in the refrigerator for an hour. In a separate bowl, mix together flour and cornstarch until evenly dispersed. Dredge marinaded chicken in flour mixture.